The sewing school is currently being moved into new space. Various painting and carpentry projects are in the works to finalize this area for use. We are planning to cover the windows in the computer room with plexi-glass and shades in order to cut down the dust. Funds are still needed to complete projects including the exterior stucco, painting, millwork and plumbing for the dental clinic. We are close to finishing this space, and if funding comes available, this can be operational in late fall of 2013! Funds have been donated to provide equipment. The construction team is reviewing the options available and working on a plan. The need for classroom space continues to grow. Our goal is to be able to provide a total of 18 classrooms, a library and computer room. We anticipate that this will take several years to accomplish. Currently, temporary space has been found to house a library. Our construction team is working on a long-range plan regarding classroom space and costs. This includes remodeling the old clinic space for school use. Construction has begun and the building is scheduled to be complete by August 31, 2013! The funding for the roof has been provided and as of last week the trusses are being delivered. 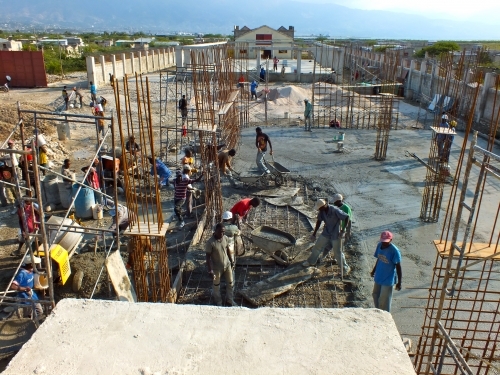 Funds are still needed to complete the church building. The members of this church lost their building 3 years ago during the earthquake. They have showed great dedication not only in physically working on site, but also they have been taking up a weekly offering to purchase blocks and finishes for the interior. The gatekeeper’s house was rebuilt in its new permanent location and the old house was removed to give more space for the new church sanctuary. Funding for this project has been provided. The field is complete except for sod. Before the sod can be laid, we are working on finding a viable solution to keep it watered. We would like to provide a clean water facility similar to the building and equipment provided at Blanchard. The timetable for this work to begin would be after the Phase II school and church are complete. We also have plans to provide toilets between the church and future school cafeteria. These will also be adjacent to the future clinic and in place of the existing latrine. Drawings will be developed this year with construction planned for next year. Funds have also been provided for playground equipment. Ground work has been done and equipment should be installed this spring. An existing recreation area is in need of rehabilitation. Funds are needed to complete work on the 3rd floor expansion project. This space has been dedicated for a new library, computer classroom, art classroom and office space. Funds have been given to replace the roof that was severely damaged in Hurricane Isaac last fall. The staff at the school has asked to also have a library. The feasibility of this project will be looked into more closely in late spring. 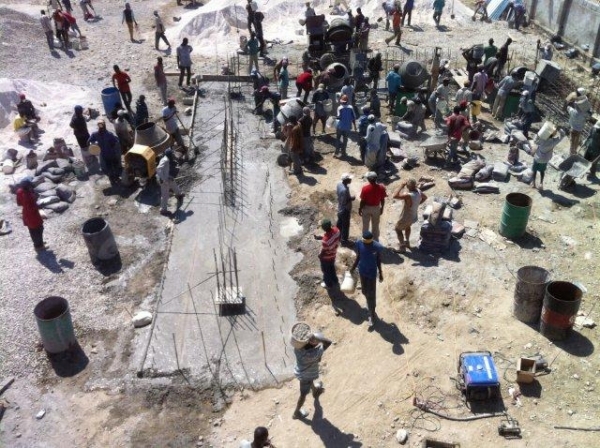 We use mission teams to assist our Haitian workers in a wide variety of ways. Whether you are a skilled laborer or can carry tools, you can help! Pray with us regarding the continuing financial needs. You can contribute to the general construction fund or if you feel led to do so, you can contribute directly to a particular project. Please use the write-in option on our donation page. Twenty-five years ago Leon Dorleans was asked to lead a Bible study in Cité Soleil. The people were hungry for the Word of God and he was able to serve them in that way. Only the Lord knew that this simple Bible study would soon become something so much bigger. Leon’s Bible study quickly grew to such large numbers that the group decided Leon should start a church. As Leon tells the story, he told the group that if God wanted Leon to start a church, God needed to tell Leon that he was supposed to start a church. And God did just that. 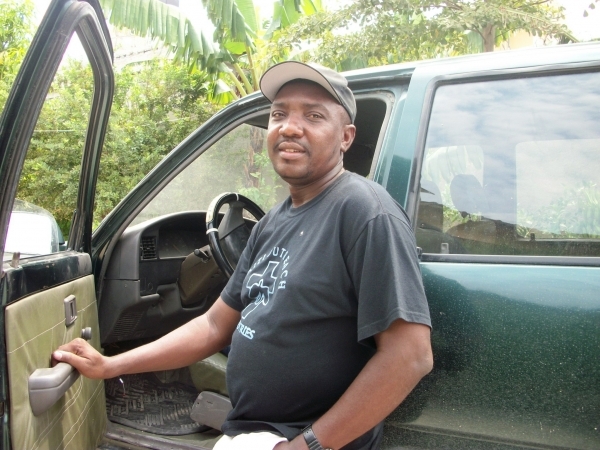 Leon received signs that he needed to work with these people as their leader and began his work as the senior pastor at Cité Soleil in March of 1988. He wanted to do more than just preach, he wanted to train leaders and equip them to do the work. Leon says that the true church grew as a result of that dream. There are now 4 churches, 4 schools, 2 medical clinics, 2 vocational schools, and now a new high school being built as a result of that first Bible study in the streets of Cité Soleil. A special service was held in celebration of the 25th anniversary of the Cité Soleil Church on March 3, 2013. Lay Pastor of the Repatriote church, Aly Honore, led the congregation in a number of praise songs. Choirs from other HOM churches visited and shared their talents with the congregation at Cité Soelil. Pastor Luc Aristhene conducted the sermon for the service. Pastor Leon received a plaque to commemorate 25 years of ministry, as well as a number of other people recognized for their service to the ministry. Six deacons, one deaconess, and one pastor were ordained and recognized by Pastors Leon, Profaite, and Luc. The pastors prayed and laid hands on the men and woman to bless them and their ministry. Leon often says the best is yet to come. He believes that his work is not about him but about God and that God has a much bigger dream than what Leon can even imagine. Visit our gallery to see pictures from this event. Read about our history here. In the United States you are probably familiar with the never ending demands placed on the pastoral staff where they have to administer their churches, meet with committees both during the day and the evening, conduct Sunday worship, funerals and weddings, visit church members, and the list goes on. Therefore, it is critical that Pastor Luc and Pastor Profaite have reliable transportation allowing them to get where they need in a timely manner and not worry about vehicle problems. Over the last year both Luc and Profaite have experienced major problems with their vehicles that have led to significantly higher maintenance costs and days where they don’t have access to their vehicle. If they don’t have their vehicle they are forced to use the Haitian mass transport system known as tap-taps which though relatively inexpensive require considerable time to get from one point to another. Both of them have incurred large repair bills but when one item is fixed it isn’t long before there is another major and costly item to repair. HOM has recently reached a decision that it is necessary to assist Luc and Profaite with procurement of replacement vehicles due to the critical needs within their ministry and the high replacement costs. The cost of a new vehicle is approximately ,000 since these have to be imported into Haiti with customized and reinforced features for use on Haitian roads and to combat the accelerated wear and tear vehicles experience in Haiti. Even a used truck in good condition could cost as much as $25,000 but there aren’t as many available. Just to purchase two trucks for Luc and Profaite could easily run over $60,000. In time additional vehicles will be needed for use by other staff so HOM is asking supporters to give prayerful consideration to this critical need. Two trucks have been found and have been recommended for purchase. Among factors that were considered are: durability and longevity, availability of genuine parts in Haiti, and availability of local experienced mechanics. The approximate cost of each vehicle is $36,000. Luc’s current truck is now inoperable and Luc has to rely on either mass transit or other means to get him to where he needs to be on a daily basis. Profaite’s truck is currently running although still in critical need of replacement. Please pray with us that the funds will come available for this situation. We periodically send out HOM news in the form of a newsletter, print and electronic. Our latest edition is attached and includes information regarding priority construction projects and communications.